Prepare a shallow baking pan with non-stick pan spray. Add the rice to 3 cups boiling water in a medium saucepan; cover and simmer 50 to 60 minutes. While the rice is cooking, put the chicken in the prepared pan. Bake, uncovered, 20 minutes. While the chicken is cooking, saute the onion, pepper, and garlic in the oil in a large skillet for 5 minutes, until tender; add the curry powder, thyme, and salt and blend thoroughly. Add the tomatoes with their liquid, and the parsley; heat to a simmer. Pour the sauce over the chicken and sprinkle with the currants. Cover and bake at 350 degrees F. for 25 minutes. 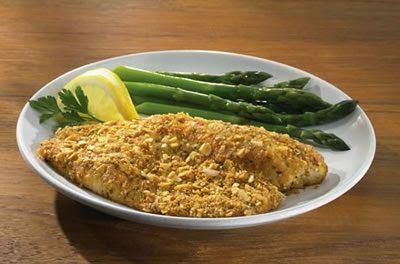 While the chicken is cooking, toast the almonds in a small skillet over medium heat for 3 minutes, or until lightly browned and fragrant. To serve, arrange the chicken parts next to 1/2 cup rice on individual plates. Divide the sauce over the rice. Sprinkle the almonds over the chicken. Serving Size: 1 breast half, or 1 drumstick and thigh, plus 1/2 cup rice and 1/2 cup sauce. How Much Do We Know About Antioxidants?